Bringing Naval Station Sanford’s heritage to life required personal devotion, sacrifice and generosity. After years of planning,fundraising,acquisition and restoration, NAS Sanford Memorial Park was officially dedicated on Friday May 30,2003. The park is located at the entrance to Orlando Sanford International Airport. 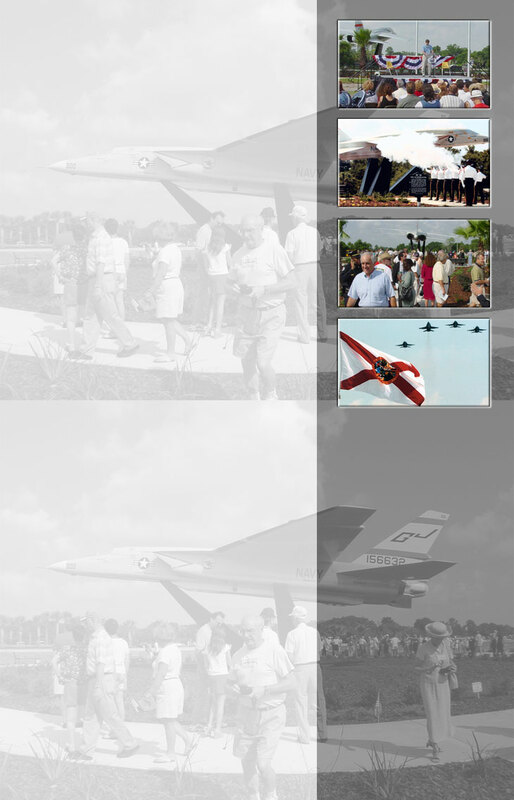 The park and a fully restored RA-5C Vigilante aircraft honor the heritage of Naval Air Station Sanford and all those who served at and supported the base. The ceremony was attended by over one thousand friends and supporters, many who are veterans who were assigned to the base. One of the highlights of the day was a flyover by four Navy F-18 fighters in the “missing man” formation honoring the memory of the pilots and crews that had lost thier lives while serving at NAS Sanford.Speakers included U.S. Representative John Mica,State Representative David Mealor,Hill Goodspeed from the Museum of Naval Aviation in Pensacola and Jack Dow,the president of the Sanford Airport Memorial Committee. A special guest speaker was Captain Gerald L. Coffee. Captain Coffee was trained at NAS Sanford as a RA-5C Vigilante pilot. While serving aboard ship and flying a mission over North Vietnam his aircraft was hit by enemy fire and destroyed.Captain Coffee was captured and spent the next seven years as a prisoner of war.